The survey of more than 1,900 business travelers revealed that travelers from the Americas are also more likely to check-in more than once a day (47%), whether by phone, text, email, or other methods, compared with travelers from Europe (37%) and APAC (32%). While there were similarities across the Americas, Europe and APAC, the study exposed key differences in the ways and frequency with which business travelers connect with family. For example, European travelers (49%) are more likely to use a phone to communicate with family and friends while traveling compared with 43% of those from the Americas and 41% from APAC. Conversely, travelers from the Americas (20%) are more likely to text family and friends than those from APAC (17%) or Europe (13%). 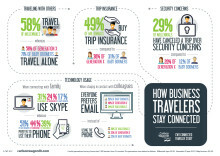 Regardless of location, CWT’s research revealed that around a quarter of travelers from each region Skype their families. 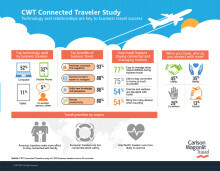 The CWT Connected Traveler Study was created by Carlson Wagonlit Travel and conducted through Artemis Strategy Group March 30-April 24, 2017. Survey data was collected from more than 1,900 business travelers between the ages of 25-65 from the Americas (Brazil, Canada, Chile, Mexico and the United States), Europe (France, Germany, Italy, Spain, Sweden and the United Kingdom) and APAC (Australia, China, India, Japan and Singapore). To participate in the study, business travelers were required to have made more than four business trips within the past 12 months. The purpose of this study was to understand how business travelers stayed connected to both work and home while on the road. Artemis Strategy Group is a communications research firm specializing in brand positioning, thought leadership and policy issues. Recently conducted research by Carlson Wagonlit Travel found that while more than one-third (37%) of European travelers are concerned about safety and security, their counterparts from other regions worry more. 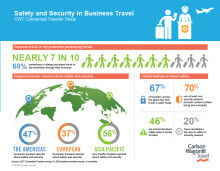 Travelers from the Americas say that they worry about safety and security nearly half of the time (47%), while Asia Pacific travelers worry the most (56%).